The Abbey was built across a narrow river valley leading to the wild and rugged Atlantic coast of North Devon, in what is now an ‘Area of Outstanding Natural Beauty’. The Augustinian monks chose this idyllic site to found their monastery in 1157AD. The last Abbey in the country to be Dissolved in 1539, it was given by Henry V111 to the Sergeant of his Wine Cellar, William Abbot, whose descendant Sir Hugh Stucley and his family live here today. The Abbey was extensively remodelled in the 18th & 19th centuries with stunning interiors by Sir George Gilbert Scott and John Meadows; you can see Mediaeval, Queen Anne, Georgian, Regency and Victorian architecture and decoration, including a complete example of the century of Gothic revival. 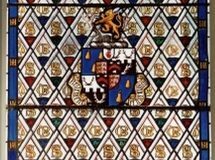 Many of Sir Hugh’s ancestors have been prominent in local and national history; they include politicians, courtiers, soldiers, High Sheriffs and pirates! Consequently the Abbey contains much of interest to visitors. Portraits by Gainsborough, Reynolds, Hudson, Ramsay, Kneller’s portrait of Sir William Stukeley who saved Stonehenge for the nation, and many other paintings; murals by Alfred Beer of events in history in which family members took part; the famous Alhambra Corridor by Sir George Gilbert Scott; ancient documents from 1160AD including Lewis Stucley’s vindication of escorting his cousin, Sir Walter Raleigh, to the Tower of London; much fine furniture, of which the huge, circular, segmented dining table fascinates visitors, fine porcelain, Chinese artefacts, Victorian and Edwardian photographs including those of the Sudanese Campaign of 1898. The museum and dairy also have much of interest on display. The Gothic Library by John Meadows with its fabulous ogee fireplace by Batty Langley is very much a family room. Our Cream Teas are delicious and all home made; very good light lunches are also served in the Old Kitchens Tea Room. 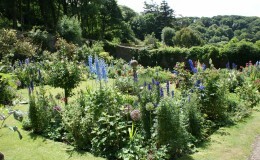 Having visited the house, the constantly evolving gardens are a must! (2018 saw the opening of ‘The Glade’, a pretty area in the Shrubbery which had been completely taken over by an invasive Gaulteria and now cleared and planted with scented shrubs). The higher part of the Bog Garden was cleared of ponticum andreplanted in 2018 with more azaleas and magnolias. Woodland gardens on either side of the house contain over 100 different camellias. From early spring masses of snowdrops, primroses, bluebells, violets and historic daffodils produce a wonderful display. Rhododendrons, azaleas and magnolias, at their best in April, May and June, are followed by eucryphia and many beautiful hydrangeas in late summer. In 1996 we discovered, under mountains of undergrowth, winding paths and terraces leading to the Bog Garden and Victorian Fernery, created by Gertrude Jekyll when she was a house guest at the beginning of the 20th century. We have now restored these charming gardens where you can see many different ferns, huge gunnera, primula and arum lilies amongst much else. A woodland walk leads from the Bog Garden to the hidden and beautiful 18thC Walled Gardens. A small gate in the yew topiary leads visitors through arched doorways to four intimate gardens; after years of neglect, once again many bulbs, roses, herbaceous perennials, shrubs, tender and rare plants including giant echium pininana, vegetables and fruit trees grow in abundance, within walls mirroring the contours of the valley. Tulips and alliums are stunning in April and May. Greenhouses contain many more tender plants, many grown from seed collected on our walking holidays abroad. Geraniums, streptocarpus, plumbago, jasmine and other plants from the glasshouses fill the Abbey rooms with scent and colour throughout the season. The Woodland Walk to Blackpool Mill, a rugged Atlantic Cove 1 mile away, is a carpet of wildflowers, particularly snowdrops, bluebells, primroses, wild anemones and violets, in spring. The wild and rocky coastline, with its huge cliffs, has been the scene of many shipwrecks in the past and is a spectacular and beautiful sight. It is a haven for wildlife and it is usual to see buzzards, peregrine falcons, seabirds, and many butterfly species. A zig zag path leads to the 19thC Gazebo overlooking the sea, which we restored using traditional materials in 2004. It is now a popular civil wedding venue. Recently we restored an overgrown path, unseen since 1914; it now enables visitors to make a lovely round walk in the bluebells and wildflowers. In 2011 the restored Woodland Summerhouse opened; visitors can relax here, surrounded by wildflowers, and read of Lady (Winifred) Fortescue’s wartime refuge. She had escaped Vichy France to live here and write her novels, including ‘Perfume from Provence’. Blackpool Mill Cottage was recently, in May 2015, one of many locations for BBC’s ‘The Night Manager‘. Starring Tom Hiddleston, Hugh Laurie and Olivia Colman, and directed by Susanne Bier, it was shown in February 2016. The Shell Seekers’ (Die Muschelsucker) by Rosamunde Pilcher, starring Vanessa Redgrave and Maximillian Schell was filmed here and in 2008 the BBC adaptation by Andrew Davis of Jane Austen’s ‘Sense and Sensibility’; Janet McTeer, Charity Wakefield, Hattie Morahan, Dan Stevens and Dominic Cooper starred. In May 2017 ‘The Guernsey Literary and Potato Peel Pie Society’ was filmed on the Hartland Abbey Estate. Starring Lily James, Michiel Huisman, Jessica Brown-Finlay and Penelope Wilton it is was released in April 2018. Gardeners World was filmed here on the cliffs with Dan Pearson and Alan Titchmarsh. Recently Barbour clothing did a photoshoot here for their 2013 range of clothing and Marks and Spencer shot their autumn/winter 2016 online catalogue on the Hartland Abbey Estate with some stunning images. Autumn 2018 saw the BBC return to film part of their new TV series ‘Goldigger’ near Blackpool Mill, due to be screened in 2019. In 2011 the BBC Antiques Roadshow was filmed at the Abbey. Fiona Bruce and many of the experts stayed in the house. Over 3,000 people turned up with their valuables, enough for two programmes to be made for the next series. Earlier in the year Sir Hugh was filmed for ITV’s ‘Countrywise’ extolling the virtues of this beautiful, unspoilt area. The Abbey and Gardens have appeared in numerous articles including Country Life, The English Garden, Devon Life, BBC Homes and Antiques and The Lady. ‘Going for a Song’ included objects from the house; Bargain Hunt with Tim Wonnacott was filmed here. American Vogue and Mario Testino used the Abbey and gardens as a location. The estate too is regularly used for filming; recently we had Kirsty Allsop and Phil Spencer, Top Gear with Jeremy Clarkson, James May and Richard Hammond who drove their campervan over the cliff, a documentary, ‘Landtraume’ (Country Dreams) for ZDF German television and Martin Dorey’s ‘One Man and his Campervan’ was filmed for BBC2.’Water’ with Billy Connolly and Michael Caine ‘An Element of Doubt’,’ The Passion’, ‘The Deep’, ‘Solomon Kane’,’War Zone’ ‘Treasure Island’ were all filmed on the estate in the recent past. The Abbey features in ‘1000 Best Houses’ by Simon Jenkins, and many other publications. We do hope that you, your family or your group will visit, or revisit, us. We are constantly changing our exhibits in the house and 2019 will see yet more family memorabilia on view for the first time. We will open for groups of 20+ at dates and times other than those advertised. Or during normal opening times wander at will through the house where we have charming Room Stewards in every room. We love our home, we hope you will too!